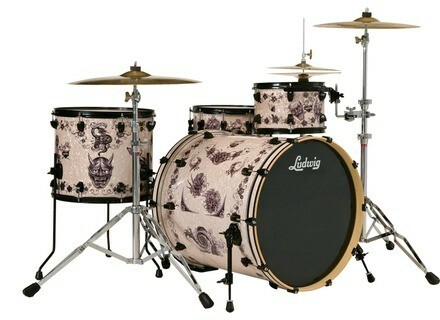 Element SE Limited Edition Corey Miller, Drum Set from Ludwig Drums in the Element series. As Ludwig Drums prepares to celebrate its 100th Anniversary in 2009, the brand has just announced the limited edition Ludwig Corey Miller Signature Element Drum Kit. According to Ludwig, these special edition inaugural kits will only be available for a short time at select Ludwig dealers. These drums feature the flash of tattoo artist Corey Miller, a representation of the close relationship tattoos have with Rock and Roll music. Corey's flash is set against a background of striking pre-aged White Marine Pearloid wrap, which aims at offering a stunning contrast to the black electroplated hardware. This kit is said to be the first production kit from Ludwig to feature a 22"x22" bass drum, complementing the kit's 7x14 snare, 8x12 rack tom, and 14x16 floor tom. More information available soon at Ludwig Drums' web site.